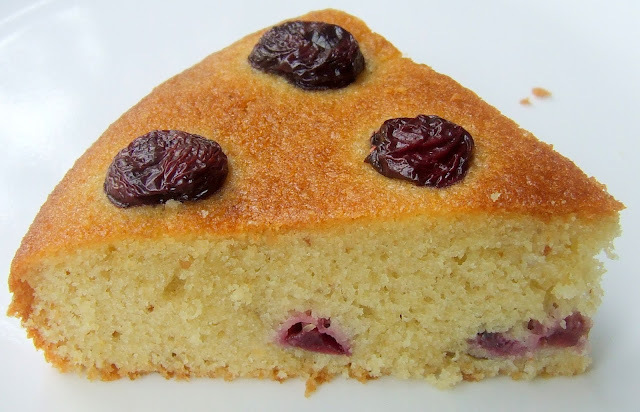 I purposely left some cherries to make Cherry Cake while making Cherry Preserve. 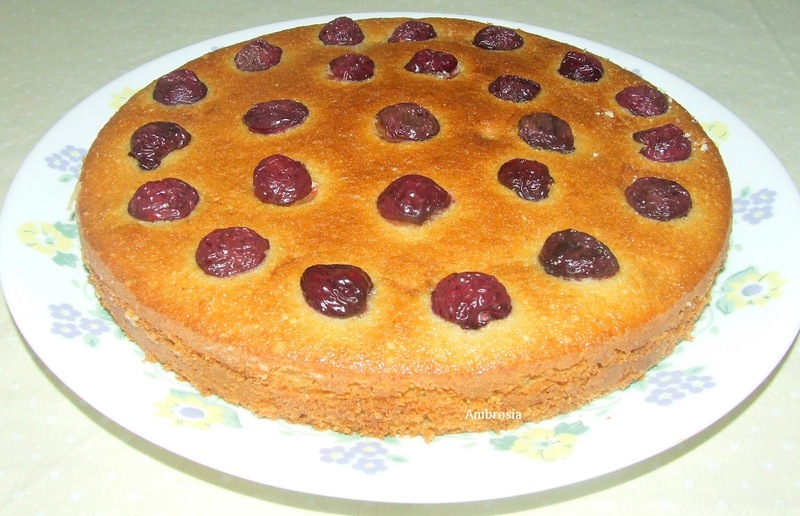 I had never baked a cherry cake before. I was excited and so were the kids. In fact, whenever a cake is baked at home, my kids get thrilled. They don’t leave the kitchen and show their complete involvement in their own way. Daughter loves to eat powdered sugar so; I have to leave some in the grinder. The little one loves to lick the butter sugar mix. There is always a fight to lick the batter from the pan. Finally when the cake manages to reach the oven, my son pulls a chair, perches on it and keeps flashing torch inside the oven while the cake is baking. Sometimes even raising a false alarm that it is over browning and burning. These are the happy family moments to cherish forever! 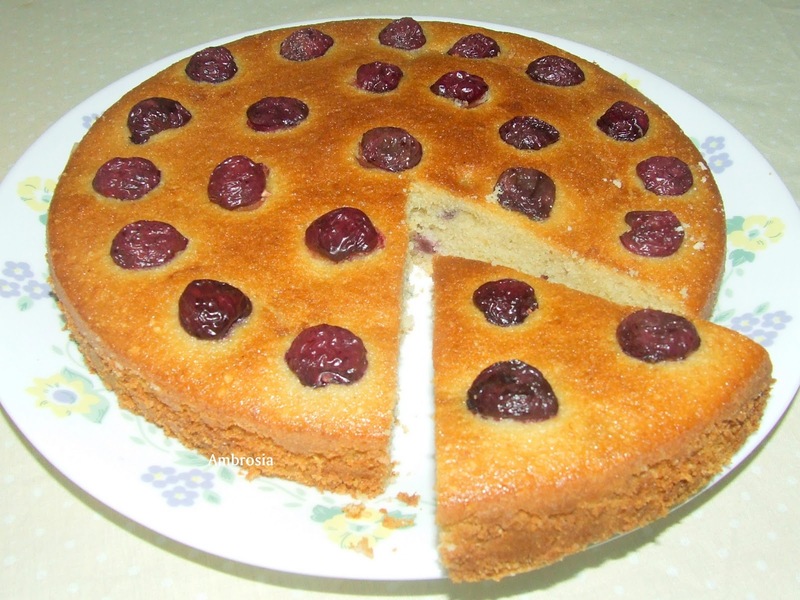 I have adapted the Cherry Cake recipe from here. 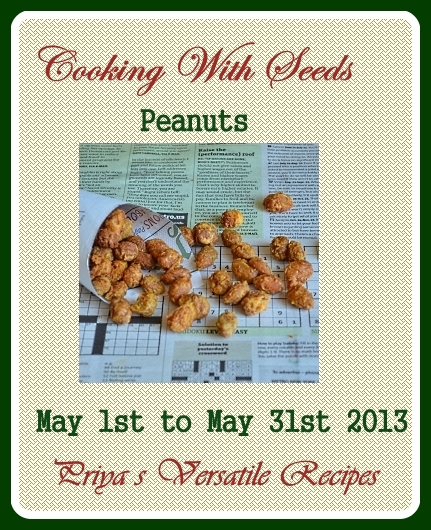 I have used ground peanuts in place of almonds. The cake turned out to be extremely soft. Given below is the recipe that I followed to make Cherry Cake. Pre heat the oven at 200 degrees C. Grease and line an 8 inch cake tin. Wash the cherries, stem and pit them. Cut 12 cherries into half. Place them into the kitchen towel with cut side down. Cut the remaining cherries into quarters. Melt the butter in a pan. Set aside to cool. 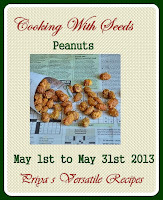 In a separate bowl, mix together flour, ground peanuts, baking powder and salt. Beat eggs and sugar for 5 minutes till thick and light coloured. Add melted butter, vanilla extract and milk. Mix till the ingredients are well blended. Add flour and mix until just moistened. Fold in quartered cherries. Pour the batter in the cake tin. Bake for 15 minutes. After 15 minutes, remove from the oven and arrange the halved cherries with the cut side down on the top of the cake. Bake further for another 15 to 20 minutes till the top turns a nice golden or a skewer inserted in the center comes out clean. Slide in a foil if the top is over browning. Remove from the cake tin and transfer to the rack to cool. This truly is 'cherry on the cake' Love the fact that your children enjoy and participate in home cooking/baking. Amazing use of peanuts instead of almonds. Yum Yum! Wonderfully delicious and spongy looking cake. I just want this cake right now! Can I, Please? Omg, such a beautiful cake, love the addition of peanuts here, wonderful..Thanks for sending to CWS. Just beautiful. can't get enough of cherries this season. Must try your recipe soon. Looks delicious.